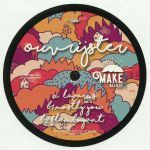 Review: Long-time Amsterdam selector and digger Ouvrijster goes legit on Sleazy Beats Black Ops new label Make Believe Disco with three immaculate slices of glitterball deep house. "Lazarus" is a sprightly piece of Farina-level jazzy magic with persistent keys and subtle dub effects, "Mostly You" ups the jack factor with layers of hypnotic rippling washes and "Flamboyant" dims the lights with a sultry, loopy groove and the perfect balance of cosmic flare. Stunning.